Who’s your favourite actor to photograph? I’ve done about 18 movies of Robert De Niro. You talk to anyone in the business and few of them have 18 anythings with each other. What’s so great about De Niro? He’s extremely serious about the craft. A lot of his work is done before the first day of shooting – his research is so methodical. 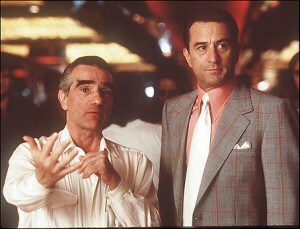 There’s pictures that I have between Scorsese and De Niro that no one has. Pictures of Marty in rehearsal with the actors in Casino , where even the Director of Photography wasn’t allowed in the room. There’s anguish. There’s pride. There’s compassion. Sometimes you can see the frustration in their faces. Do you plan your photographs with stars like De Niro? When Bob had Men Of Honour coming up, he introduced me to this Navy guy with tattoos all over his hands and arms. He had this one tattoo in a very strange location – near his thumb. And Bob was like, ‘Take a picture of that.’ That’s the kind of visual stuff that he uses to remember his character. Bob got a temporary one put on his thumb. If you look at the poster of Men Of Honour you can see that tattoo. Do you ever get intimidated by major stars? You’d be surprised. When Brando came on the set the first day for The Score , everyone was all sphinctered up. Watching their P and Qs. But I introduced myself and he just put his hand on my cheek and says, ‘Call me Marlon. Let me know what you need.’ Jack Nicholson was the same. Well, somebody had to bring that up! I was well-paid. When I read the script, I couldn’t see this being number one at the box office. Could you tell something was going on between J-Lo and Ben Affleck? How do you see your role on the film set? As the still photographer, you’re there to cover not only the director’s vision of what’s he’s trying to do with stills, you’re there to cover all of the days that are shooting. You’re branding a person and a product. What’s your biggest tip for being a great on-set photographer? Most still photographers don’t understand the film process: the schedule, the continuity, coverage of the scene like the masters and the close-ups. My secret was to be more comfortable on a film set than anything. I started at a very young age because my dad was a cameraman and my cousins shot John Wayne movies. I was always carrying a still camera and I knew what to do. I was the first guy shooting digital on a set 15 years ago. But digital is forgiving enough that people don’t have the pure quality of the craft in their mind, they just want to get the product shot. Do you get to see some of the behind-the-scenes tricks of the trade? Who’s the biggest on-set prankster you’ve worked with? What’s the most fun film you’ve worked on? Meet The Parents was probably the most fun I’ve had. It’s a funny thing, when you run into any crew member who’s worked on Meet The Parents, you look at each other and instantly smile and start laughing. It truly was that much fun. Shooting that whole dinner scene took so long because everyone was laughing so hard. You’d hear laughing in the background. Bob was biting a hole in his tongue. We just had to cut so many times. Oh my god, it was like every day. Bob had to go back to the trailer and do his make-up. How do you capture moments like that on camera? So you’re trying to capture something the film cameras can’t? You try to capture something different to what the film cameras do, but you still have to respect the director’s vision. So with Bringing Out The Dead , you’re not going to try to give the pictures a Steve-Martin-comedy feel to them. On Bringing Out The Dead with Nic Cage, I basically constructed the whole shoot to mimic the lighting pattern of the movie. Nic Cage was fun. But he’s also there for work – the guy delivers the product. Nic Cage was a guy from day one, showed up on the set, puts his chair next to the director’s chair, sits there. They say, ‘Oh, it’s gonna be two hours to light this scene, do you want to go back to your trailer?’ And he says, ‘No, I’ll stay here.’ He wants to dedicate himself to the whole process. How do you shoot things the film cameras can’t see? Is it best to be discreet or make the actors aware you’re there? The best compliment I got was from Francis Ford Coppola. I gave him stacks of these photos and he said, ‘I don’t remember you taking any of these…’ To me, that’s perfect.